MacBook Air (13-inch, 2017);MacBook Air (11-inch, Early 2015) ; MacBook Air (13-inch, Early 2015) ; MacBook Air (11-inch, Early 2014) ; MacBook Air (13-inch, Early 2014) ; MacBook Air (11-inch, Mid 2013) ; MacBook Air (13-inch, Mid 2013) ; MacBook Air (11-inch, Mid 2012) ; MacBook Air (13-inch, Mid 2012). The 45W MagSafe 2 Power Adapter features a magnetic DC connector wih LED light provides charging status.The Magnetic DC connector makes it easy to disconnect the cord harmlessly and your MacBook Air stays put safely.It also helps prevent fraying or weakening of the cables over time. 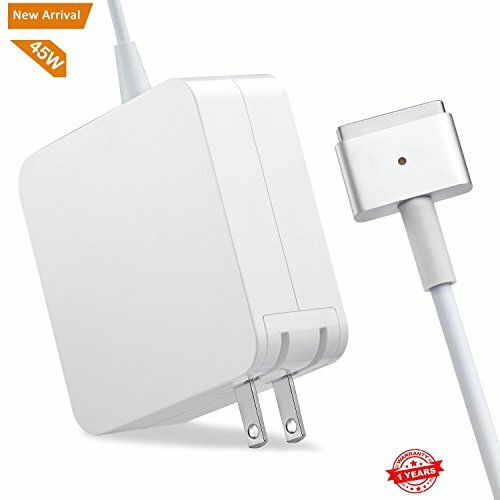 Missaka provide our fan-favorite one years warranty to this MacBook Air Charger. If you cannot confirm whether this charger suits for your MacBook or not, please feel free to contact with us for help. Thank you! Guarantee: Missaka provides 60 days Money back, 360 days free replace Warranty, Now Click"Add to Cart"to Make your notebook easy to use anywhere. If you have any questions about this product by E-POWIND, contact us by completing and submitting the form below. If you are looking for a specif part number, please include it with your message.